The Battery Extractor-Mounted Water Tank (BE-WC-SS) is designed to mount on the rear of all standard Single Level, Double Stack, Triple Stack, Quad Stack, and Competitor Replacement Operator Aboard Battery Extractors (BE-SL, BE-DS, BE-TS, BE-QS and BE-MT). The BE-WC-SS is designed for battery fleets with single point watering systems but can be used with the manual Water Gun (WG-X) if needed. This large-volume water tank assists in forklift watering tasks, and replaces mobile water tanks to save space in the battery room. Oil-free design ensures that water will emerge clean and pure, ready to keep electrolyte levels within optimal specifications. 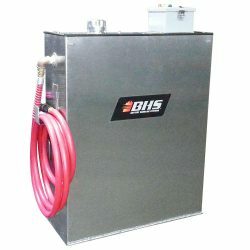 To learn more about forklift battery watering solutions from BHS, call our sales team at 1.800.BHS.9500.